Hey, wait, why did I always think that the It Cosmetics Vitality Lip Flush Lipstick Stain was a clear balm sort of formula? The shade Je Ne Sais Quoi always appeared a clear balm to me so I never indulged. Surprised was I when I got a sample to try out and it actually turned into one of those perfect shades of pink. It Cosmetics Vitality Lip Flush Anti-Aging Lipstick is a balm, a gloss, and a stain all in one. Vitality Lip Flush Anti-Aging Lipstick Stain is a conditioning lip balm but I beg not to use the term balm as it doesn’t do the formula justice. The texture has a glossy, soft feel that glides across lips leaving behind a hydrating, shiny finish. The texture is like warm, melted butter, it just glides across lips beautifully. Loaded with plum and cherry oil plus shea butter, aloe, and jojoba the formula works to hydrate, condition, and nourish lips through the wear so you’re never left with a dry feeling or a formula that dries lips out during wear. It’s also packed with anti-oxidants like acai, green tea, and vitamins A, C, and E to help fight free-radicals and keep lips smooth and healthy. Of course, all that moisture is something to rave about but what I love is the staining effect. The lipstick is a pale milky shade of pink but applies as a naturally flushed pink look on lips. It’s very healthy looking and merely enhances the color of your own lips without looking too pink, fuchsia, or just generally overdone. Even after the glossy finishes wears away you’re left with a pretty flush for a few hours after application! If you’re looking for a lip product that not only treat lips and hydrates them but also imparts a natural hint of color as well Vitality Lip Flush is the perfect little product that does all three. Do try this one, I bet you’ll love it as much as I do. Is this available at that CVS 360 or whatever? I know I heard they were getting shut down, but I THINK the one nearby is still open..
mmmmmmmmmmmmmmmmmmmmmmm maybe?! I don’t have a 360 around so didn’t even know they carried IT! I’ll have to give it a look then~. I am pretty sure they carry this line but I’ve only looked a couple times so I can’t say I am 100% sure. That Beauty 360 is already closed down :(. I’ll have to order online…was hoping to avoid the shipping fee! I think you’ll like peach, it’s a really nice lippie! Oooh that looks very nice! mustnotbuymorelipproductsmustnotbuymorelipproducts! 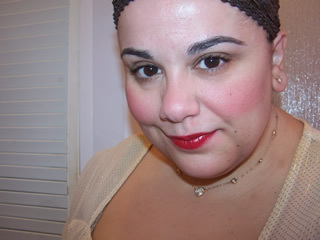 I have Je Ne Sais Quoi and Damsel I got in a duo from QVC and love them both. Damsel is a warm peachy pink and a great neutral. I have been wearing both so far this summer to my son’s baseball games. Keeps my lips very hydrated, leaves a stain behind and have SPF. What more could a gal want. Really like this product. That looks like a cute little balm! I think I’m going to pick up the trio ;-D! WOW that color looks really different on you as opposed to the swatch. Do you have super pigmented lips or does this apply darker than it looks? agreed! it’s such a glossy, hydrating finish quite reminds me of Lipstick Queen’s Jean Queen lippie’s formula! Looks lovely on you. These have been on my lemmings list for awhile. sorry blue I tossed it! aw thanks d! hope it’s easier to navigate for you hun! wow..this is lovely..just like the way I want my lip balms to be..
Ahhh….now I feel like I need these too. I’ve been on the fence for a while–your reviews are great and I always check your blog when I’m researching a potential new buy. Beautiful color, texture, feel on the lips. But…it melts very easily under normal conditions. Can’t carry it in my pocket. Very disappointing.